Business intelligence implementation can seem like a daunting task at the outset. There are so many moving parts, needs, and requirements that finding the right starting point may feel like a shot in the dark. However, one of the most important aspects of running a successful business intelligence project is finding the right starting point. Clear starting points can help you launch new projects faster and acclimate to your platform’s tools. It can make your life and the life of your end users a bit easier. In this “BI Implementation Insights” series I’m going to walk you through implementing your analytics with the least amount of hiccups as possible. In this first post, I’ll give you a quick and easy cheat sheet to always finding the right starting point for your projects. Start by identifying who will be the first groups to benefit from your dashboards. Consider that dashboards generally have two sets of users, who together are dashboard stakeholders. They are the power users and business users, and their buy-in will determine the success of your dashboarding project. Power users are analysts and other data experts who will spend a lot of time using the software. Business users are the end users who rely on the data from the BI platform to make decisions every day. New projects need to consider the needs of these users. Open with questions to identify opportunities. Your goal is to identify your power users’ low hanging challenges and processes that you can quickly and easily use BI to solve or automate. Start with simple challenges like basic analyses and tasks with lower data complexity, such as ratios, top/bottom x items, and data from a single data source. Throughout this process, you will test new features and explore relevant data to tackle bigger problems. You will prove value by creating simple-to-use dashboards that both introduce BI into your core group’s workflow and provide a clear ROI in terms of time saved. Now for that cheat sheet I mentioned earlier. 1. Identify primary stakeholders for your project. 2. Pose questions that need answering. 3. Evaluate the complexity associated with each. 4. Choose low hanging fruit first. 6. Use the agile methodology to create your implementation towards a small batch of high priority KPIs. This methodology consists of three phases – planning, execution, and delivery. 7. 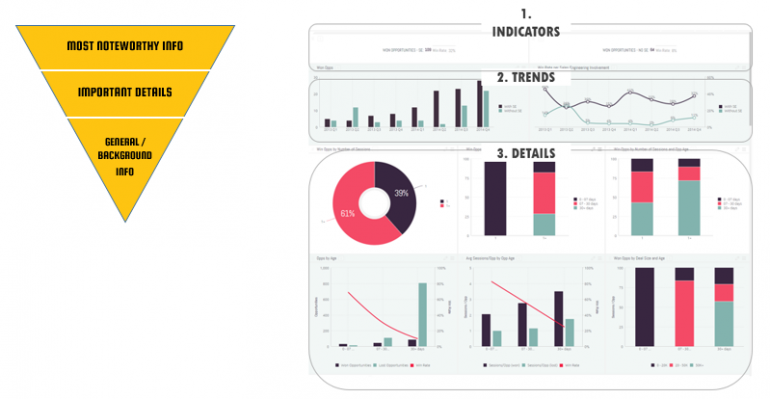 Use the inverted-pyramid model and start dashboards with high-level indicators, working down from indicators to trends to details. By doing this you’ll be displaying the most significant insights on the top part of the dashboard, trends in the middle, and granular details at the bottom. With your project launched, your KPIs will start yielding insights and new questions will begin to emerge. This allows you to start experimenting by approaching the same issue from different angles and casting a broader net in terms of the datasets you’re using and how you’re using them. Once a model is designed, analyzing the data via different dimensions can yield insights that were not obvious before. For example, if you have data on ad unit performance, analyzing it vs the size of the units could reveal interesting results: does ad unit size influence the click-through rates? What else are you missing? Combining tangential or parallel data points to your datasets can yield correlations that answer questions you hadn’t even thought to ask and present meaningful insights you might otherwise have missed. If you follow the eight-step cheat sheet above you’ll be well on your way to a smooth and effective analytics implementation. Implementations don’t stop there, though! Coming up in the BI Implementation Insights series I’ll talk about building a BI team for success, how to outline an implementation timeline, and a deep-dive into how to identify early wins.